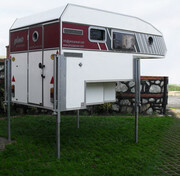 I have been working on our press release for our caravans and demountables. Still early days in the introduction of Pino into the UK and we are learning as we go. We know caravans, however demountables are a whole new area for us to learn about and we would welcome all advice! As a tiny team in the UK who are made up of a designer, he has a Phd and has a 4 generation pedigree of engineering, who has always had caravans, me the sales and marketing professional with a lifetime of family business behind me and the level headed guy with many skills we do make an interesting bunch. Having Aberdonian values, 'buy a expensive well made pair of shoes and dont buy another for another 10 years.' With that Philosophy and our engineering, design expertise and a love of freedom and travel, we had to take on Pino. We would be delighted to work with an individual or a group who would like to progress demountables from Pino in the UK. Presently they have all been custom and loaded at the factory. I can easily have them shipped, but we would need to be very specific about measurements and do some work with the attachments in advance to ensure all goes to plan. Here is press release. I can send on all demountable pics on request. Pino waves goodbye to soggy caravans. Pino Caravans lead the way in ground-breaking caravan design and construction. These micro-caravans are hand built by craftsmen using boatbuilding technology harnessing the centuries old craft of boatbuilding in Turkey, the global home of todays super yachts. 'Pi'oneering Pino, famous for the micro caravan Pi2010, has recently introduced the larger P280, offering a bunk option, shower and a full size fridge. With central rear door this innovative design is once again a classic of the future. Lightweight and watertight, every weekend can be a holiday with Pino! Pino Caravans are unique, innovative and handcrafted using superyacht technology, these are both lightweight and watertight. Environmentally aware, there are no fibreboards used in the construction of a Pino Caravan. Using multiple layers of laminated wood, with final lamination being fibreglass and spring back memory foam insulation, they are robust and suitable for year-round use. If you happened to damage the panels, like a boat, you fill sand and polish, there is no fibreboard to act like a sponge! Fitted with custom, hand built units you have optional stains, colours and fabric choices, You can keep it cool and classic, or indeed bling it up! Catrina Petrie, Marketing Director of Pino Caravan’s UK head office said, “We have recently had orders for a caravan with a tartan interior and one with a gold exterior! Presently we are designing one in purple for a UK sound engineer for festivals”. Using global brand leaders such as ALKO, Dometic and Truma, Pino caravans can be serviced globally. Starting at a mere 400kgs, the Pi2010 can be safely towed economically by the smallest of car. With a 6’8” double bed, sink and stove, on a fully braked AlKO chassis, you can be assured that this is a fully functional caravan, available is a custom awning from Gerjak. The Pi’s design, with wheels to the rear, makes towing a dream and a perfect first caravan that is easily stored on a driveway. Catrina added, “I found this easy to manoeuvre and is great for inexperienced young, old and solo travellers. As well as the Pi2010, the company has recently added the P280 which a little larger and offers a bunk option, shower and full size fridge. Pino also offer larger family options in the P300 and P400 series and demountable. Pino offer a quality, simple and robust range, which have the essentials important in true touring and allowing freedom to roam and explore. Starting at just £7,999 for a Pi2010 and £10,495 for a P280, they are well priced and made to order. Introduced to the UK in late 2014, Pino have been manufacturing in Turkey for several years and supplying into Europe, their design, manufacturing techniques have been honed after several years of global research, with this vast knowledge they are proud of their quality and are leading the way in construction methods. A Pino caravan is a caravan for life. Pino Caravans UK, Drill Hall, Meadow Place, Crieff. PH7 4DU.